Embassy Loans is Miami’s leader for loans on your auto title, specializing in loans for auto titles, auto equity loans and auto refinancing. As a licensed consumer finance company, Embassy Loans Inc. reports to a national credit bureau to help their borrowers in establishing or re-establishing their credit history. All of their equity loans range from 12-18 months and are based on the amount of loan. The interest rates are 24% up to 30% per year and are also based on loan amount. 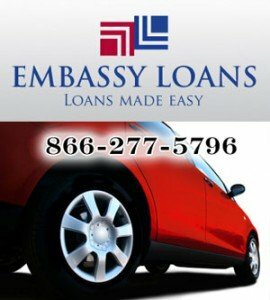 At Embassy Loans Inc., they follow a simple procedure for approval of loans and loans can be funded the same day! Borrowers just need to fill out their online loan application and their representative will contact them shortly with a decision. They must provide proof of residence and proof of employment unless self employed. Embassy Loans is a consumer finance company licensed under Statute 516 [Consumer Finance] in the State of Florida. Because we specialize in equity loans, loans are based on equity, not personal credit scores – and are made regardless of personal credit history.